A way of working with others designed to maximise the benefits of co-operation. Understanding the need to collaborate is one aspect – it is also a case of with whom and in the right way. Engaging with the workforce to think this way is critical (across functions, up and down, and including the supply chain) to creating a culture of difference and inspiring everyone to work like this. Collaborative working offers an alternative and enhanced capability to build new value propositions beyond the capabilities of an individual organisation. Organisations have become complex systems that rely as much on external relationships as on the immediate workforce. While physical structures are impossible to avoid or ignore, the focus must be on the entire value chain and each member’s contribution to the ultimate ambition. Understanding the flow of value through the system and appreciating everyone’s part in it is critical to achieving the seamless integration that everyone speaks of but few reach. So go well beyond the ‘Organisation Chart’. Mentoring and organisational support to promote collaborative alliances between businesses and suppliers. Developing networks of within-sector and cross-sector organisations. 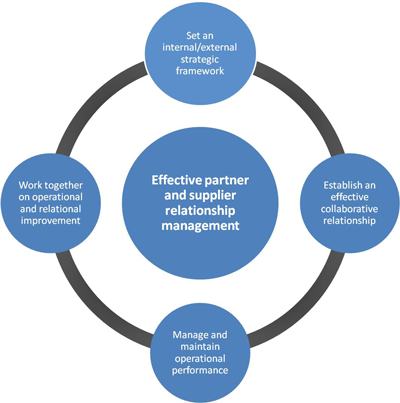 Organisation Partnering Indicator (OPI) – we can offer a tool to analyse the characteristic partnering style of an organisation or business function. Facilitating the design and implementation of service and process driven collaborative initiatives. Increasing competitive advantage through improved performance. Talk to us about creating collaborative capabilities and culture for your business.